Amir is about to take a few exams. One amongst them is a multiple choice question. It will help him get relaxation in few classes in his college. He has studied a lot for the exam and is well prepared but still nervous. The reason is not because he doesn’t know the text; it is because he is afraid he is a bad test taker. Knowing the material is a different thing and answering it correctly in the exam is a different task. If the test is a multiple choice one, he feels all the more anxious and cannot get over his fear of multiple choices. However not many know that there a few strategies that can be employed when taking such multiple choice question tests or MCQ tests. If we use such tactics, we can do greatly in such exams, even if we don’t know the answers to few such questions, we can answer them by guessing to the nearest possible answer. Of course the most important thing is to know the material being covered in the exam, however, beyond that also there are a certain things that can be done to improve the chances of clearing such tests. When you have read the question carefully, understand what is required for you. Are you supposed to identify the best answer or an alternative that is false? Verify whether or not there is an option stating “all of the above” or “none of the above” before you mark your answer. Use the false/ true technique which will help you in selecting between two similar answers. To do this, decode the question into a statement with each of the probable answers and then you should select the one which is true. After you have successfully identified the right type of question, you should do a quick evaluation of all the given probable answers. More often than not, the type of answers given will suggest you what type of answers are right. For example, if you are surprised by the options given, it means that you have not understood the question carefully and you need to read it again. And in the end, you need to match the answer with the question that has been asked. Some questions are meant to confuse the answerer. They contain abundant information and often, more than half of it is redundant. You need to read the question carefully and then analyze which information is required to answer and which is not. Filter the important points from the question. For example, a question states that A has three apples, two oranges, five peaches. B has five grapes, four peaches and two oranges. How many apples does B have? At first, it might look like that we need to calculate the number of fruits they have but in fact the question is asking only for the number of apples which B has. So, it is very important to keep calm and read what information is relevant and what is not. Obama, Lincoln, George Bush and Rajat Singh. Very clearly, Rajat Singh can be eliminated as he wasn’t American President. So, there are always few such answers and after eliminating them, you are left with fewer choices to choose from. So, you should always narrow down your choices when you cannot get the answer in the first shot. When taking a question you don’t know the answer to, ignore the conventional words like go for the middle answer or avoid any answer that uses the word never, always, all or none. As per a famous researching author on this subject, this conventional method doesn’t hold true against the statistics he has collected through his research. He says that around 53% of the times, options like all of above or one of above were correct. So, we can say that choosing one of these answers gives you a probable 90% improvement over random guessing. Author also found that correct answers are usually not repeated consecutively, so looking at the answers of the questions you can figure out those questions that you are stuck on. For example, if you have same options for four questions and you also know that the answer to Question no.1 is A and that of Question no.3 is D, then you can realize that A and D wouldn’t hold true for Question no.2. Knowledge outsmarts guessing but when taking a guess, follow this strategy and you will probably be right. It has been found in researches that usually the longest answer was correct among all the given options. The makers of test have to make sure that the right answers are the best indisputably and this needs some qualifying language along with detailed explanations. They try so hard with it that the answer gets longer word by word. So, if have no idea about the answer and notice an alternative longer than the other options, it is most probably, the right answer. Ideally multiple choice tests are without any pattern and randomly set. However, all tests are written by humans and the human nature makes it almost impossible to be absolutely random. Hence a few patterns, few theories have been found in the research on which above points are based. All will emphasize that the actual knowledge of the subject is the best strategy but when you don’t have it, it is better to have the above given strategies with you because guessing smartly will improve your chances of being correct. An old saying goes – Failing to prepare is preparing to fail. It is true and should be remembered. Prepare for the tests and it not only means studying for long hours, but make sure that those sessions are effective as well. Another way to bomb a test apart from not studying is carelessness. 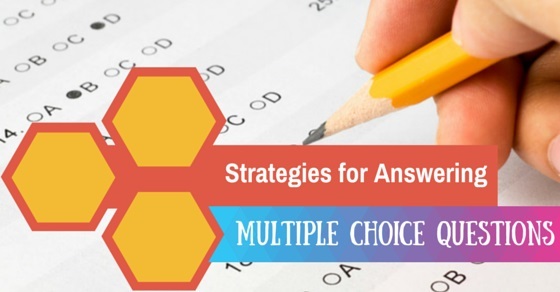 Multiple choice tests can be taken by following a few tactics and if you don’t study and don’t pay heed to the above strategies as well, it is a bigger sin. So, follow the above points and clear the tests without any anxiety and restlessness. Next articleHow to Get Ready for the New Age Recruitment?